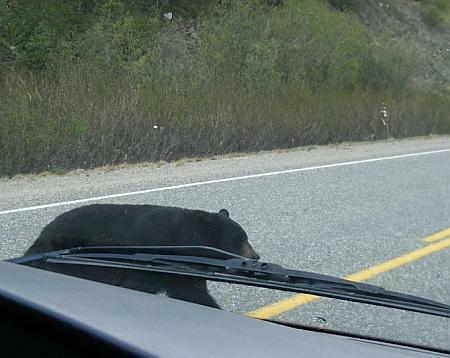 Alaskan Blog » Blog Archive » Why Did The Bear Cross The Road? Long and busy day today. I left Juneau on the fast ferry Fairweather to Skagway, where I hooked up with Alaska Direct Bus Line (call 867-668-4833 in Whitehorse and ask for Henry, it’s literally the only way to go from Skagway to Fairbanks by land) for the trip over the mountain to Whitehorse. 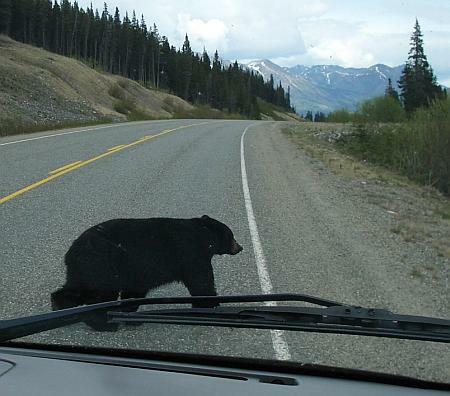 Tomorrow it’s on to Fairbanks — a long but very scenic bus ride. A long day, but fun. Now I’m kicking back in a Whitehorse motel drinking 7% peach-flavored apple cider from a two-liter bottle. Why don’t they sell this stuff in the states?